The Cadillac DTS is a full-size luxury car with full-size American power and a warm, spacious interior. It's big, powerful and luxurious. Its V8 engine develops 275 horsepower, and a higher-output version is available that delivers 292 horsepower. Though its styling is restrained, the DTS is loaded with technology. Yet you don't have to study the owner's manual to make the DTS do its job. This is a rational luxury car, easy to operate in addition to being large and luxurious. We like that. The DTS offers impeccable road manners, with crisp handling and good grip that inspires composure and driving enjoyment on winding roads. It handles surprisingly well given its size. It takes turns with poise and dignity, making it an enjoyable steed when the road goes curvy. The DTS is front-wheel drive. The current DTS was launched as a 2006 model, sporting fresh body lines, a redesigned interior, upgraded running gear, and suspension refinements. It replaced the 57-year-old DeVille nameplate. Changes for 2009 are minor. There are three new colors. The outside rear-view mirrors have new turn-signal LEDs and clearer Side Blind Zone Alert icons, there is a new 17-inch, nine-spoke alloy wheel with a ChromeTech finish (optional), the disc brake rotors have a treatment that inhibits rust so they look better, and there are a few other additions and detail improvements. 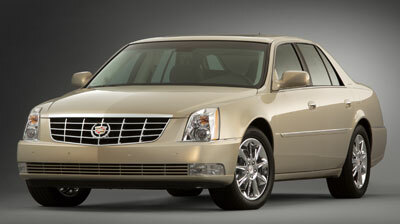 The Cadillac DTS is available with six-passenger or five-passenger seating. It comes in several models, all powered by Cadillac's 4.6-liter Northstar V8, which produces 275 horsepower, or 292 horsepower with certain option packages. A four-speed automatic transmission is standard. The DTS ($45,855) comes standard with leather upholstery, dual-zone automatic climate control, eight-way power front bucket seats with four-way adjustable power lumbar support, eight-speaker AM/FM/CD/MP3 audio with RDS and integrated antenna, XM Satellite Radio with three-month trial, Magnasteer power steering, cruise control, power windows, power programmable door locks with Pass-Key III Plus security, illuminated visor mirrors, remote starter, driver information center, auto-dimming rearview mirror with compass, rear seat pass-through, OnStar with one-year Directions & Connections service, automatic headlamps with wiper activation, fog lights, solar-control glass, self-leveling suspension, and P235/55R17 all-season tires on machined aluminum wheels. The 6-Passenger Luxury Package ($3,000) adds park assist, heated and cooled front seats, heated rear outboard seats, heated power-adjustable mirrors with turn-signal indicators and driver's side auto-dimming, leather wrapped and heated steering wheel, and tilt steering column. The 5-Passenger Luxury Package ($3,500) includes all the content of the 6-Passenger package, plus tri-zone automatic climate control and a universal remote transmitter. The Premium Luxury Package ($5,230) includes the two previous packages, plus an upgraded stereo with a six-disc in-dash CD changer and eight Bose speakers, cargo net, IntelliBeam headlights, front four-way massaging power lumbar, power tilt/telescoping steering column with memory settings, trunk mat, rear illuminated vanity mirrors, genuine Dark Burled Walnut wood trim and 17-inch chromed aluminum wheels. The Performance Package ($8,000) includes all but a few of the previous features, plus the higher-tuned 292-hp V8, performance algorithm shifting, Magnetic Ride Control, and P245/50 H-rated tires on 18-inch chromed aluminum wheels. The Platinum option ($4,795) is available only with the Premium Luxury or Performance Collections, and adds a power sunroof, DVD navigation, and other conveniences and trim enhancements. Options include adaptive cruise control ($1,695), DVD-based navigation ($1,945), a power tilt/slide sunroof ($1,200), Lane Departure Warning, and 17-inch chromed wheels ($825). Safety features that come standard on all models include six air bags, including a dual-depth front-passenger air bag. Anti-lock brakes and Brake Assist, StabiliTrak electronic stability control with all-speed traction control come standard. Child-safe rear door locks and a tire pressure monitor come standard. Lane Departure Warning and Side Blind Zone Alert are available on select models. The Cadillac DTS is a big car. Its overall length of 207.6 inches makes it five inches longer than the Escalade full-size SUV, and nearly a foot longer than the STS, Cadillac's next-largest sedan. DTS is almost four inches longer than a BMW 7 Series and 2.6 inches longer than the latest long-wheelbase Mercedes-Benz S-Class sedan. It's also wide, more than two inches wider than an STS. Despite its size, however, the clean forms of the DTS give it a European look, though in a distinctively American idiom. With its vertical headlights and tail lights and its egg-crate grille, the DTS has acquired the design heritage of the Cadillac family and adapted it to 21st-century reality. It acknowledges tradition, yet remains fresh and modern. The nose is particularly expressive, with jewel-like xenon headlights framing an expansive chrome grille adorned with a center-mounted wreath-and-crest badge. Chrome trim accents the body-color door moldings, and a narrow LED high-mounted stop light runs nearly the entire width of the deck lid's crisply edged rear contour. The fenders provide a purposeful stance, and the profile is slightly wedge-shaped. Seventeen-inch machined aluminum wheels come standard, 18-inch wheels are available, and those wheels can be ordered chromed. The overall look is brought together by Cadillac's characteristic spline line, which rises from the top of the front fender, runs along with lower edge of the side windows and then flows over the rear fender. The Platinum option is distinguished visually by 18-inch chrome wheels, chrome grille, chrome inserts on the exterior door handles, and a Platinum badge. Cadillac boasts that the DTS has some of the tightest production tolerances in the world, and it certainly looks the part of a well-honed luxury machine. The panels fit well, the paint is glossy and blemish free, and overall the DTS wears its bulk well, like a fine-tailored suit. The quality of GM cars has been improving, and Cadillac scores well in quality surveys. The DTS cabin is roomy and luxurious. The interior was completely revised for 2006, and only detail changes have been made since then. Leather and wood abound, along with chrome accents, creating a handsome, upmarket environment. Low-gloss surfaces, with a three-dimensional grain, were chosen for the upper instrument panel and upper doors in order to reduce glare and absorb sunlight. The base leather is called Nuance. A more supple, semi-aniline Tuscany hide is included in the Platinum option. The Nuance interior benefits from fitment of a material crafted from a vinyl/silk blend for seatbacks and armrests. Claimed to be as durable as vinyl, it has the look and feel of leather. The trim used on base models is Dark Babinga wood, while Premium and Performance levels get Dark Burled Walnut. Found on the shifter head, center console, around the center stack and across the upper section of the instrument panel, the wood trim creates a flowing theme throughout the entire interior. Door handles, selected knobs and switches, shifter column surround, and rings that wrap the four analog gauges are chrome, which works with the wood to create an upscale feel. Instruments use white-on-black LED readouts for speedometer, tachometer, fuel and temperature gauges. On five-passenger models, the center console between the bucket seats houses the shifter and storage bins. On six-passenger models, the shifter is mounted on the steering column to accommodate the front bench seat, which has an integrated center armrest that transforms from a back cushion into a console with two levels of storage. The cabin has a spacious feel and good sightlines for driver visibility. Facing the driver is an attractive four-spoke wood-and-leather steering wheel with a finely etched wreath-and-crest center badge. The 6-Passenger and 5-Passenger Luxury Collection version include a heated steering wheel on a tilting column; Premium Luxury and Performance add a telescoping function. The center stack design is attractive and the controls are easy to see and use. A Dark Argent finish surrounds the radio and HVAC control heads, which are set flush into the console for a well-integrated look. Nestled between air outlets, high up in the center stack, is an analog clock, in keeping with other high-end automobiles whose clocks measure time in the traditional way, which we like. The rear seat is large enough for a couple of six-foot-plus males with a few extra pounds of girth; and fitting a smaller fifth passenger in between them is no problem. The seatbacks are nicely raked for long-range comfort. Seat heaters are available for the outboard positions. Comfort is, of course, a primary component of luxury, and we drove both Luxury Premium and Performance editions of the DTS to get the full dose. We especially liked the tri-zone climate control, and the cooling for the front seats. However, the heat and cooling controls are set high up and forward in the door panels, making it hard to see if they've been turned on. It's one of the few ergonomic miscues in the DTS; otherwise, there are no difficult or hidden controls or complicated electronic interfaces to mar the luxury experience. Worthy of praise is the ease of using the sophisticated audio system. Our ears were treated by the Bose audio system, which features eight speakers and centerpoint signal processing for multi-channel surround sound. The Platinum option offers hand-cut-and-sewn leather on the instrument panel top pad, console and door trim. French seams highlight the door panel inserts. Wood trim is light Ash with a decorative inlay, which lends a more bright and airy feeling than the Dark Walnut Burl. The steering wheel is leather-wrapped as well, and accented with the same light Ash bordered by chrome rings. The headliner and sun visors are synthetic suede. LEDs provide ambient lighting in the footwells, and even the floor mats and trunk mats are made from a more deluxe material. A sunroof is standard, and a headrest-mounted rear DVD audio/video system is available. The available DVD navigation system comes with voice recognition and a 6.5-inch color screen; you can even watch movies on the screen when the car is in Park. Last year its maps were expanded to include Korea and Taiwan, two of Cadillac's overseas markets for the DTS. Language choices offered by the driver information center include Arabic. Smooth and powerful, the Cadillac DTS glides over miles and miles of open road in supreme comfort. Maybe that's expected, but the DTS also handles surprisingly well for such a big car, making it a satisfying drive when it's time to turn the steering wheel. The DTS has a worthy powertrain in the form of its smooth-running Northstar V8 and robust Hydra-Matic four-speed automatic transmission. Under full throttle, both versions of the 4.6-liter engine emit a mellow bellow that says V8 but not in a flashy way. The electronically-controlled throttle is responsive, yet delivers a smooth, measured rise of power rather than a soul-stirring burst. Two states of tune are available, though we don't see dramatic differences between them. The 275-horsepower version boasts 295 pound-feet of torque, while the 292-horsepower Performance engine offers 288 pound-feet of torque; the Performance-tuned engine gives up some torque for increased horsepower and the base engine actually supplies better off-the-line acceleration. Likewise, the Performance chassis comes with bigger wheels and tires and Magnetic Ride Control, a continuously variable real-time damping system; but spring and stabilizer rates are identical to those on the other versions. In short, both engines deliver excellent performance, but the Performance version is slightly sportier. All DTS models come with GM's superb StabiliTrak electronic stability control, which limits understeer and oversteer by automatically applying the brakes to individual wheels. All models come with Magnasteer, a magnetic variable-assist rack and pinion steering gear that reduces noise and column shake. These features, along with its rigid chassis, give the DTS able handling and a smooth ride. The variable-rate steering helps the big car turn into the corners with good response, and carving a line through curves is accomplished with little body roll. The steering feels a little light while cruising down a straight road, but it stiffens up nicely when feedback is needed during a turn. A bit of chassis hop over freeway expansion joints is virtually unavoidable, but the Magnetic Ride Control does a good job of muting the effect. Otherwise, at speed on smooth pavement, only a bit of wind noise around the A-pillar and occasional tire thunk suggests the car is covering a lot of ground quickly. Frigid days and scorchers are handled well by the DTS. We like the standard Adaptive Remote Start, a factory-installed convenience for cold, wintry mornings, when the ability to get the engine and interior defrosted and heated (including the front seats) before starting out is appreciated. Those who live where it gets hot will find the system useful to crank up the A/C before climbing in on those 115-degree afternoons. Owners in the frigid north will also appreciate the heated windshield wiper fluid. The Lane Departure Warning (LDW) system engages above 35 mph. A green light indicates that the system is turned on and working. Should the driver cross a detected lane marking without signaling, the light flashes amber while an alarm beeps three times. The system is designed to alert the driver in order to take appropriate action to move the vehicle back into the correct lane. To avoid nuisance alerts, the system is designed to not provide an alert if the turn signal is on or if the driver makes a sharp maneuver. Thankfully, the driver can also switch it off, in which case the light goes out entirely. The system uses a camera located between the inside rearview mirror and the windshield to detect lane markings on the road and alert the driver when the vehicle inadvertently strays from the correct lane. The Side Blind Zone Alert system uses radar to sweep an 11-foot zone on either side of the vehicle; in other words, about one lane over. The zone starts at each side mirror and reaches back about 16 feet. With the system engaged, an amber symbol lights up in the outside mirror whenever another vehicle enters this blind zone. The system uses radar sensors behind the rear fascia that signal an audible and visual alert if objects are detected where it might be difficult for the driver to see them. Cadillac cautions that the system is not designed to detect vehicles outside of the side blind zone that may be rapidly approaching, or pedestrians, bicyclists or animals. It's designed to ignore infrastructure such as fire hydrants or parked cars. In addition, the system displays do not come on while the vehicle is approaching or passing other vehicles. Adaptive cruise control is a radar-based system that automatically slows the car when it's catching up to a slower-moving vehicle in the same lane, then speeds up again when the offending vehicle moves over or speeds up. The high-intensity discharge projector-beam headlamps are augmented by IntelliBeam, which automatically switches from high beam to low beam and back again depending on oncoming traffic. In the past, it hasn't always been easy to discern when the high beams are on in a Cadillac, so this is a welcome features. Good nighttime vision is vital to safety. The Cadillac DTS offers luxury and comfort in a full-size package. It comes loaded with safety features, with the option of the latest safety technology to warn the driver of hidden hazards. The DTS delivers strong acceleration performance and handles quite well for a car of its size. It's a lot of car for 50 grand. NewCarTestDrive.com correspondent Greg Brown filed this report from Southern California. Head/hip/leg room, f: 39.2/56.9/42.5 in. Head/hip/leg room, r: 38.6/56.7/41.6 in. Cargo volume: 18.8 cu. ft.